WWE / YouTubeDaniel Bryan will make his return to the squared circle after being forced into retirement two years ago, with his first match back likely taking place at WrestleMania. Daniel Bryan announced his return to in-ring action on Tuesday night, over two years after he was forced into retirement due to injury. Bryan was one of the biggest stars in the WWE when he was forced to give up wrestling, and his return has the potential to shake up the wrestling world, and become one of the best stories in wrestling history in the process. After thanking his wife, his doctors, and his fans for their support, Bryan was Powerbombed onto the mat in a later segment, proving once and for all that he was ready for his return to action. On Tuesday, WWE tweeted out that in a shocking turn of events, Daniel Bryan had been cleared to wrestle again, more than two years after concerns over concussions forced him into retirement. 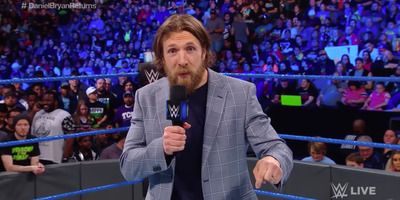 Later that night, Bryan, who had remained within the WWE Universe in the role of “SmackDown” general manager, made the announcement official. With fans chanting in joy and disbelief, Bryan said that after years of seeing doctors and working to get healthy, he was back, going as far as to tease his official return in a potential match at WrestleMania. The moment was years in the making. In 2014, Daniel Bryan was on top of the wrestling world, having climbed the mountain to overcome both his opponents and the expectations of what a WWE champion looks like to win the World Heavyweight Championship at WrestleMania 30. Bryan was merely an undeniable force. His push to the top came not because he was the WWE’s ideal wrestler, but because the wrestling world demanded it. Fans fell in love with him thanks to his skill as a technical wrestler, a move-set perfectly matched to his undersized frame, and his unique ability to connect with a crowd unlike anyone else the company. After more than a year of being almost undeniably the most popular wrestler on the roster, Bryan took home the biggest title in sports entertainment. But his moment at the top would be shortlived. A month later Bryan was forced to give up the belt as he underwent neck surgery. He made another brief return to the ring a year after that, only to once again be pulled from the action without apparent reason. Fans would later learn that due to lingering injuries and WWE’s concern over his history with concussions, Bryan would have to retire from in-ring action. This move did not spell the end of Bryan’s role in the WWE though. He remained involved with the company, serving onscreen as the “SmackDown” general manager – setting up matches and interacting with wrestlers on the microphone without meeting them in the ring. All the while, rumours loomed that Bryan was healthier than WWE had let on and that doctors outside of the company would be able to clear him for a return to the squared circle. Bryan’s contract was due to end in 2018, leading many to speculate that he would return to the indie scene to wrestle again once he was free from his commitments to WWE. Instead, WWE fans got something even better – Bryan is back, and if his interaction with Sami Zayn and Kevin Owens was any indicator, he’s more than ready to take a few bumps in the ring. While a beat down like this would in most cases be a simple way to develop a feud, with Bryan’s extended absence it took on an extra significance – if Bryan can take a Powerbomb into the mat like that, he’s ready to take all sorts of bumps in the ring. Minutes later, his injury was back into the world of WWE unreality, with the company claiming that the injuries sustained here could potentially ruin his return at WrestleMania. Things are lining up for him to tag team with “SmackDown” commissioner Shane McMahon against unruly employees Kevin Owens and Sami Zayn at WrestleMania in April. From there, anything can happen – whether a feud with The Miz over their beef during Bryan’s injury or a run back to the biggest title in the company. Some of the best moments in wrestling are created in the in-between – when the audience can’t tell what’s real, and what isn’t. But in this case, there’s no need for embellishment. Win or lose, whatever happens next with Daniel Bryan will have the potential to be one of the greatest stories the WWE has ever told.